Has anyone installed seat heaters in their boat? I'm in the process of getting new skins for my '97 SN and am looking for recommended brands. Hard to tell which are good and will hold up. I've actually been using a $20 car seat heater that straps on the seat and it works fairly well. 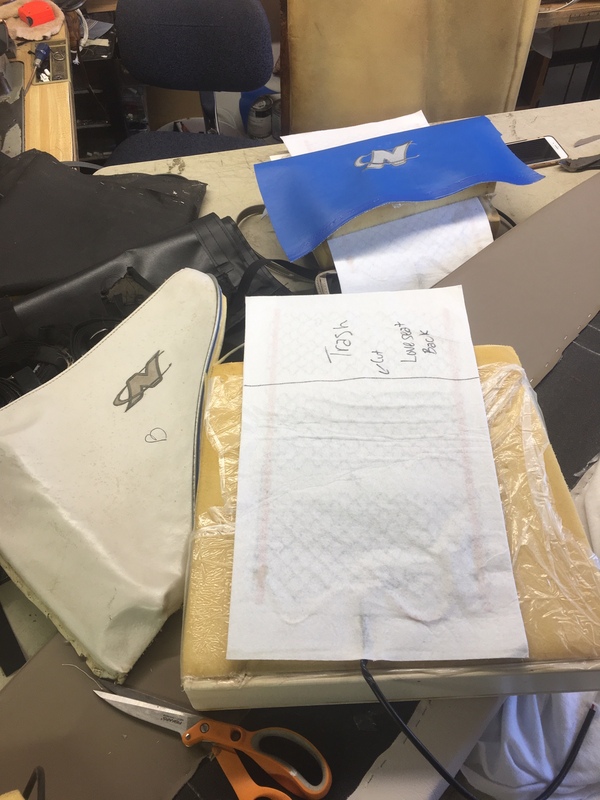 But since I'm doing the upholstery, I am going to do the driver seat cushion as well as the observer seat cushion and back. Anyone with any experience installing them? 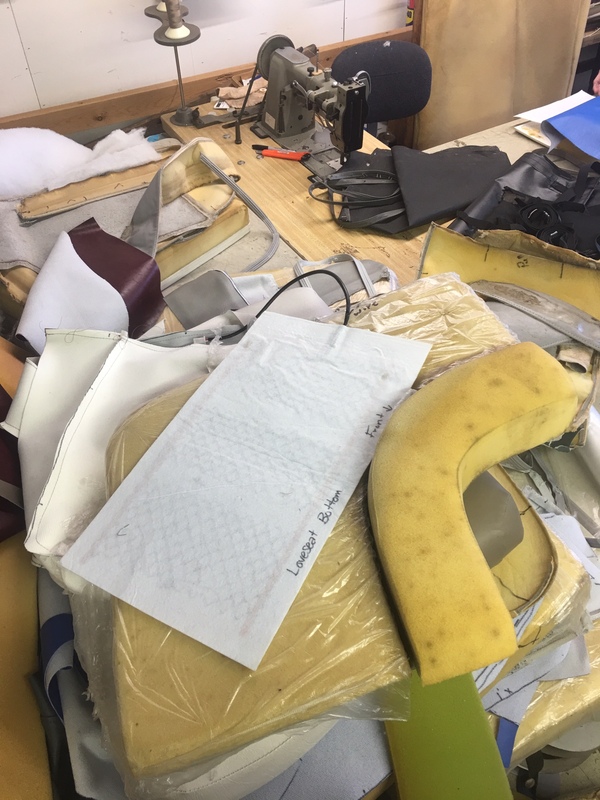 In particular, the seat cushions have two different pieces of foam with different heights and skin material runs between the two foam pieces to the frame to pull the seat material down in the gap. Not sure how I'm going to d elements there although I understand you can cut the elements to shape (in one direction only). Anyway, anyone with experience with this? First time hearing of anyone doing this... I'm no engineer, but I wouldn't want to do with anything where water and electricity would come in contact with anyone in my boat.. People in boats are for the most part "wet". Especially ski boats.. I put a seat heater kit in my wife’s 4-runner a few weeks ago so I have a little experience with them. They would be really easy to install on a boat seat if you already have the upholstery apart. Also, they can be cut length-wise. My understanding is that the heater element is carbon-fiber. That said, they are encased in a fabric which doesn’t look waterproof, so shorting out with a wet seat condition could be an issue. I got a 2-seat kit (4 pads total) with switches off eBay for $80 for reference. Many oem’s including MC and presumably CC offer heated seat options, so I don’t have the same concerns as Mojo. A quick google search revealed plenty of aftermarket kits that are appropriate for wet environments (boat, motorcycle). I will absolutely be pursuing these myself when it’s time to reskin my Bfn (to compliment the hot air heater I’ve already got). Also curious to hear anyone’s feedback on specific brands... good thread! Unless you jump in it alot soaking wet, Jeep ones probably designed for a more moisture than not . Their is alot of ones out there . I would just sit on a heating pad, I think they have some plastic coating.. I think a boat heater sounds like what would work better 3 outlet style. Its not a car or escalade ,its a boat. I have been on boats with seat heaters, and when they are there I used them regularly in the shoulder seasons – they can be quite nice especially when combined with the typical vented heater. While water and electricity aren’t the best of friends this stuff is all low voltage and should be safe enough, although care on installation is likely needed for the elements to have a good long life. There’s plenty of youtube videos on the install of both seat heaters and boat seat covers combine the two and you should be ok. The nautique specific bits would be related to safely powering the heaters. There is typically not sufficient wiring to the dash to support the current needs of such heaters so you need upgraded or dedicated power lines. Additionally, if you want the ignition switch to be on to use the seat heaters (and you do or eventually you will kill the battery) then I would suggest you add a relay in addition to dedicated and fused wiring back to the engine (or the battery). I don't think you are likely to have more than 3-5 amps per seat, but I have seen boats where that was enough load on the ignition circuit that the ignition system wouldn’t get proper voltage at speed to run the engine, particularly when combined with the current draw from the heater fan. I agree with Joe on using a relay given the voltage to dash issues we deal with even without accessories. CC has been heating the driver and passenger seats since 2013/14 IIRC. Great add on and switches can be fully hidden under the dash. I need to do the seat bases in my BFN so that will likely be on the list of things to do while those skins are being redone. Grant West did this on Bling*Bling over 10 years ago. Absolutely these will be on a relay (as is my heater, stereo, etc.). As has been pointed out, it is an option on Nautiques, MC, Centurion, etc. The trick is finding good ones that will not be a problem with some moisture. Low voltage and a max of under 4 amps per pad, so not a huge draw (although the observer seat will draw more. No comment? I thought you were an expert on heated (and cooled) seats. I can’t see the need. On second thought I want heated seats. I installed this kit from Amazon in the passenger seat last spring. I ran it lengthwise on the lower level of the foam. Didn't need to cut the length. Had to extend the wiring harness to put the switch in the dash. I thought this would never get used but gets much more use than the heater. Looking to do the driver seat also. BTW .... I think it's a great idea as well and might be interested in looking at it myself. I am in the process of doing this. I will post pictures as i do it. I believe it should be really easy. FWIW I believe that it is wet rated. I’m in the process as well. Heaters were on the slow boat from China I’m pretty sure. They just made it state side yesterday so I should have them some time next week. Doing the captains chair (bottom/back) and observer seat (bottom/back). I will post pictures when they arrive and I get them positioned. @brit, How are you going to do the Captains back? With the three rolls? I wasn't planning on it on mine. Sorry, I’m doing it on a 2001 SAN. It has a flat back. I talked with a friend with a Centurion with heated seats. He said his driver seat only has the seat bottom heated, while the observer seat has both. That's what I'm planning to do. Here is a few pictures of the heaters laying on the seats how they will set. This one is not lined up very well so it looks like it’s about 6” too long but it’s really only about 3” too long. It will wrap around the bottom about 3”. I have installed Seat Heaters, not in my boat but in my GM Tahoe. They are nice to have for sure. Two issues I would need to consider in a boat. These things drink electricity, pretty strong amp draw. You may need a larger alternator to offset the new demand. I am not sure how they will perform when wet, Boat Seats get wet, not sure it this will work and be safe or how long they will last if frequently wet.. Curious to know your thoughts. Thanks for the pictures!! Looking forward to see how it goes. I just purchased the elements and my skins should arrive next week so I can try to install them the following weekend. Question: It looks like your driver seat cushion is like mine, with a front and rear foam sections. 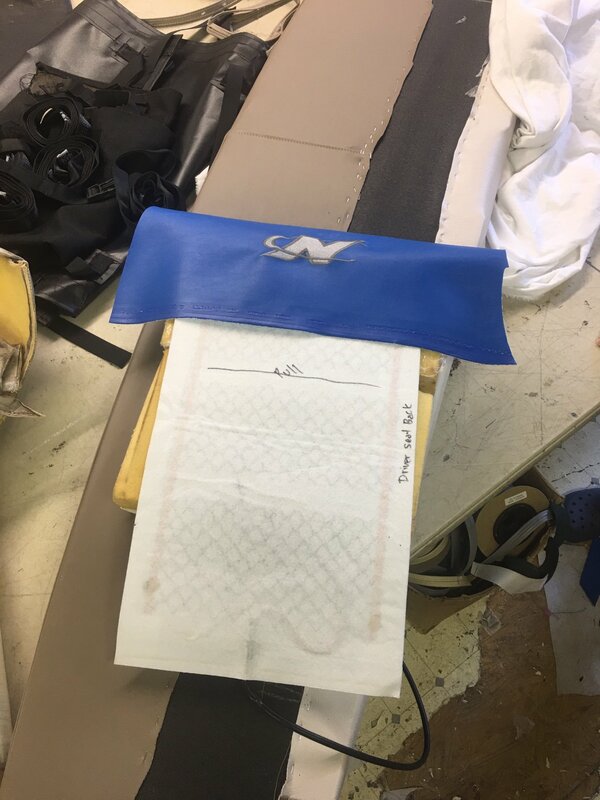 The seat skin has a flap that is pulled down between the front and rear sections to hold down the material and make it look like two parts. The element obviously won't fit there with the flap, so the options are to either not have the flap pulling down the skin (may look funny), or using two separate elements for the front and back side. I'm looking to use two elements, but I won't decide until after I get the skins back. Let us know how it goes. Appreciate the pictures!!! Since I"m doing the same thing in a week and a half, I really appreciate this!!! Oh, I'm not doing the driver seat back but am doing the observer seat back. My seat back is open on the lower part, and the upper part consists of three 'pillows'. I have been using a cheap plug in car seat heater (about $20 on Amazon) for years. The bottom side is great (very warm and comfortable). However, since I'm usually in a warm coat when driving, I don't really feel the warmth of the seat back. Besides, it is not practical to try to put elements in the 'pillows'. Sorry, not clear. I'm doing the driver seat bottom cushion but not the seat back. I'm doing both the seat back and seat bottom on the observer seat. The first picture I posted was the driver seat bottom. You’ll notice the heating pads have gaps between the elements. I drew a line and wrote the word pull where that vinyl will get pulled down. It lined up perfect to where the pull is between to heating element sections. The pad will be cut in the middle between the outer edges where the circuitry wiring is. I have really left it up to the upholsterer to fine tune it so we will see how it turns out. Should have these pieces back next weekend. I will update once finished. Did you get your skins back? I got mine on Monday, so I'm going to attempt the seats this Saturday. If you've done any of them, I'd love to see some pictures, especially how you did the pull downs. 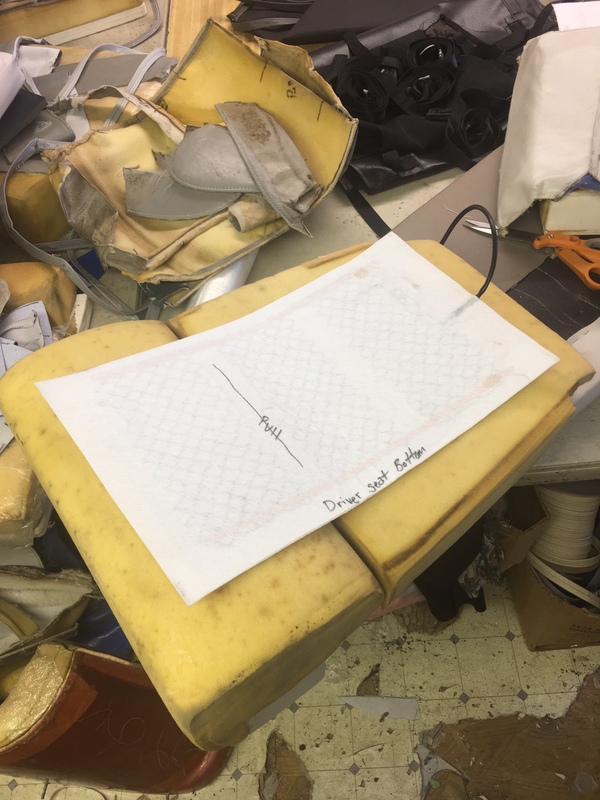 Looks like you will cut through the section without the elements in the middle, and pull the seat pull down skin through that opening to staple to the frame. I haven't had a chance to lay out the elements on the cushions yet; may not get to it until Friday evening. I'll also have to figure out how to route the driver seat wiring. My carpet is shot but I'm thinking of replacing it with Sea Dek, but don't know if I will be able to make it look good or not. I guess I could drill down through the floor underneath the seat frame into the bilge, and then route the wiring up to the bow. That's probably the cleanest, but permanent wiring will happen after I'm done and all the seats work. I'm thinking I'll mount the seat heater switches by the heater switch (next to the ignition lanyard behind the throttle). Hey Man0Seven, how are you doing with this? Since you have a '98 (I have a '97), it should be just about identical. BTW, if you have done the driver seat back cushions (pillows on the driver seat back), please let me know how you do them (what order, etc.). Step by step pictures would be great if you have them. That's what I'm most concerned about, making them look good. The heater element will only be in the seat cushion (bottom) of the driver's seat, while the observer seat will get both seat back and bottom. That part will be fairly easy (assuming I can get the pull down done correctly with the seat element in place. I'll plan on taking pictures myself. I just found my stainless steel staples so I can finish. Yes, I am cutting through the pad and then pulling the tuck through and stapling it back down. The observer seat I am going to do ask pictured. Then one in the back.